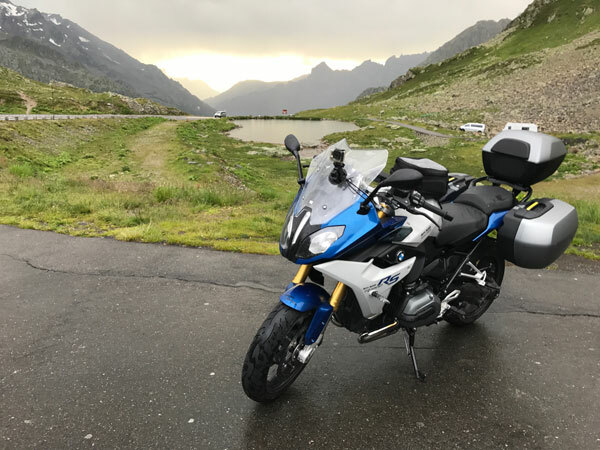 After spending the better part of two weeks in the saddle of a 2017 BMW R1200RS riding the Alps and Dolomites of Switzerland, Germany, Italy and Austria, I have developed a pretty good idea of what this bike is about. 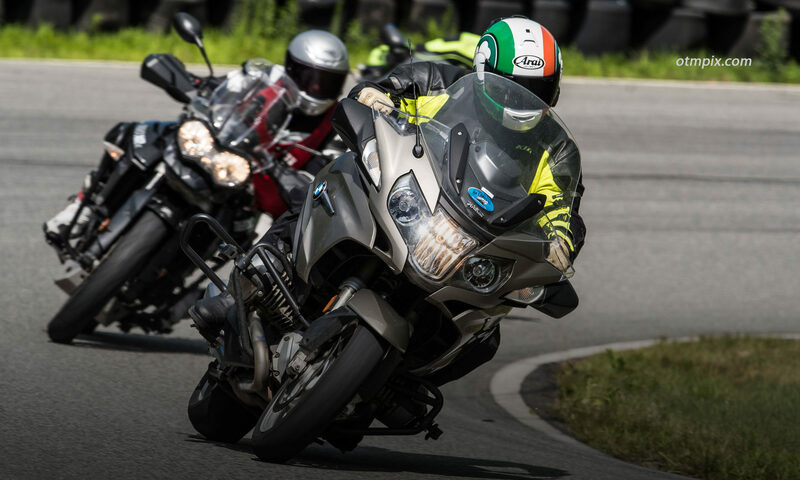 The R1200RS is Beemer’s sport touring bike that uses the ubiquitous 1170cc boxer opposed twin motor. 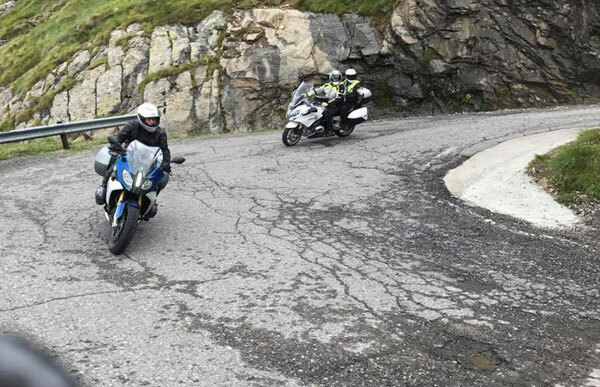 The RS is essentially the faired version of the R1200R naked roadster. Similar bikes include the Ninja 1000, FJ-09 and Suzuki GSX-S 1000F. Or even the Motus or Energica E-bike. You can familiarize yourself more with the specs and details of the RS at the BMW Motorrad website. The base price of the RS is around $15,000, but you’ll quickly find yourself nearing or exceeding the $20k mark after adding the Premium package and luggage. 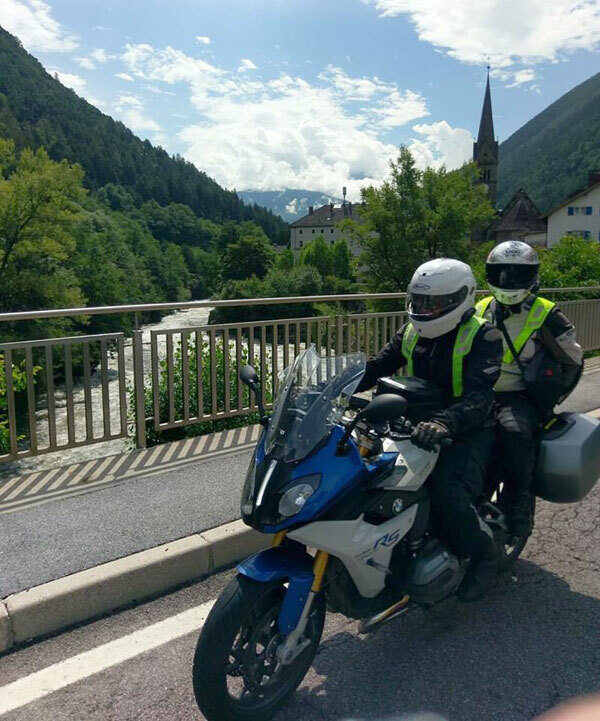 The bike I rented from Moto Mader in Oberentfeld, Switzerland was equipped with the Premium package that includes among other things, Dynamic Suspension Adjustment (DSA) and Gear Shift Assist. The BMW site says the bike retails for $21,125 as it was equipped on my tour. See the screen shots for the price breakdown and a list of goodies you get for the extra $3k. At 520 pounds wet, the RS is on the heavy side. That’s the same as the Ninja 1000 but is almost 50 pounds heavier than the Suzuki. Add another 30-40 pounds for luggage (and mounting hardware) and you’ve got a pretty hefty bike. Heck, the touring RT version is 600 pounds with luggage, so it’s not that much lighter than the full-on RT tourer, which is arguably a better package. The R1200 motor is a tractor. It produces 125 hp at the crank and 92 ft pounds of torque, so it’s no slouch. And it pulls from under 2 grand (rpm). The motor vibrates a fair amount at highway speeds, but it’s character is quite appealing. It was happy motoring down the Autobahn at 100mph, as well as pulling us up the first gear uphill hairpins. The fueling from the ride-by-wire throttle was spot on, except for a little bit of “hunting” on deceleration on long downhills. It’s not as bad as on my Tiger 800, but I did notice it. Shifting is reasonably smooth and the Gear Shift Assist allows upshifts without using the clutch or rolling off the throttle. The system worked great from 3rd-to-4th, 4th-to-5th, and 5th-to-6th, but was too rough when shifting in the lower gears. Clutchless downshifts are also rough, because it does not include the auto-blip feature found on the S1000RR. Still, it was nice to rip through the upper gears like a roadracer. One word describes the RS’s handling: stable. But that stability comes at the cost of agility. The RS handles sweeping turns, both smooth and bumpy quite well, but when the it comes to tight, slow hairpin turns the RS felt cumbersome. And slow speed maneuvers had the bike feeling unbalanced. It took me a few days to get used to the slow speed manners of the RS, which is about 2 and a half days longer than it usually takes for me to adjust to a new bike. To be fair, most of the time I had my lovely wife, Caroline in the passenger seat, which added to the unbalanced slow speed feel. One highlight is the ESA- (Electronic Suspension Adjustment) feature. The dynamic ESA really works and makes the premium package worth considering. I selected the “dynamic” suspension setting using the handlebar toggle switch and managed to stumble through the complex menu to select the appropriate mode for having a passenger. The bike comes with the typical rider modes (Rain, Road, Dynamic and User) which are easily accessed by a button on the right control pod. As I mentioned, I spent most of my time with a passenger on board. The bike has plenty of power to handle two people and full luggage. But, the RS is not the best bike for passengering. In contrast, the RT felt perfectly balanced with Caroline on the back. Go with the RT if passengers are your thing. Riding solo, the bike is much more predictable and nimble enough for me to rip down the Stella pass with confidence. See the video below. But, the F800GT I rode would be my bike of choice from the Beemer lineup for the tight stuff. I chose the RS over the naked R for the extra wind and weather protection. This proved to be a good move, since we experienced some rather epic rain over five consecutive days. The wide and relatively flat windscreen provides a decent amount of wind protection. It has a high and low setting that created little buffeting at slower speeds but was very loud at highway speeds at the high setting. Keep in mind that I’m 5’9″, so your results may vary. The seat is quite comfortable, allowing me to be squirm-free for most of the day. I did need relief after long days in the saddle, but overall, it’s quite good. Caroline was happy with the passenger seat. The heated grips were terrific when we encountered torrential rain and 49 F temperatures for hours on end. I envied the RT riders who also had heated seats and greater protection from the Alpine rain. The $1,100 optional side cases are standard BMW units that open sideways. They held plenty of stuff and were waterproof. The latches are a bit cheap-feeling and a couple of the other riders had trouble with their topcase locks failing. We had no such problems. Speaking of topcases, the small Beemer item was fine. But, at over $900.00 (I assume that includes the mounting hardware) I’d look for a bit larger Givi or Shad box for a lot less money. The small BMW tankbag is secured with straps and costs a lot of bucks for what it is. It’s not waterproof, but has an inner drawstring bag to help keep things semi-dry. My recommendation: Get a SW-Motech /Bags Connection bag that is much sturdier and uses a slick locking ring system. I switched bikes with another rider on the tour to see what the RT is like in comparison to the RS. I had been dismayed with the RS’s cumbersome handling and was a bit apprehensive about riding the even heavier RT. But, to my surprise, the RT was much more balanced. Slow speed maneuvers and negotiating the tight hairpins is a breeze. And seeing the way the solo RT riders were hustling their bikes around shows just how capable the RT is with or without a passenger. At least one rider plans to buy an RT after they got home. I can see why. One little thing I found perplexing is that the self-cancelling turn signals stay on too long. Long enough that I didn’t think the bike had the feature. Come on BMW. The RS is a beautiful bike, especially in the blue and white color scheme. I like the way the exhaust looks and the asymmetric headlights are cool. The bike sounds great and the motor is powerful and grunty. I could definitely grow to love the RS, but would likely opt for a lighter weight FJ-09 with it’s raucous motor and cheaper price. I enjoyed my time on the RS, especially after I got a better feel for it’s awkward slow speed handling. The bike rails through fast and medium-fast sweepers and hustles down the highway comfortably. And even though it’s not great in the hairpins I managed fine. Here is a video of me on the RS descending the Gardena Pass in Italy. I appreciate the unvarnished, non “bike and trip were provided by BMW” report. I completely agree with your assessment of the R1200RT. I enjoyed that bike on a two-up tour with gear in northern Spain. Fun article – thanks for your unbiased review!! I took the R and the RS for a short testride. The R bring much lighter feeling, more nimble and playful. I agree with Ken that the RS was ‘heavy’ feeling in the tighter turns. The experience was enough to put the R1200 at the top of my list. The other competitor is the Super Duke GT. Your criticism of the RS’s cumbersome handling downgrades one of the bike’s great virtues, and that is, its magnificent stability on rough roads. On several occasions I’ve had to overtake B-Doubles (very long trucks) in windy weather on rough country roads. The bike just sits there, no hint of tramlining or headshakes and no hint of wandering. Certainly it will pitch around a bit – but always holding its line. An absolutely confidence inspiring and beautifully behaved machine. And she’s also reassuring on windy days too. The price for this is slower cornering but in return it promises to get you home in one piece. She’s an absolute masterpiece. Thanks Pete. I had a similar experience with the shifter when testing the S1000RR. One model shifted perfectly, while another RR had problems. So, I know I was using the right technique and that there was a technical problem with one of the bikes.